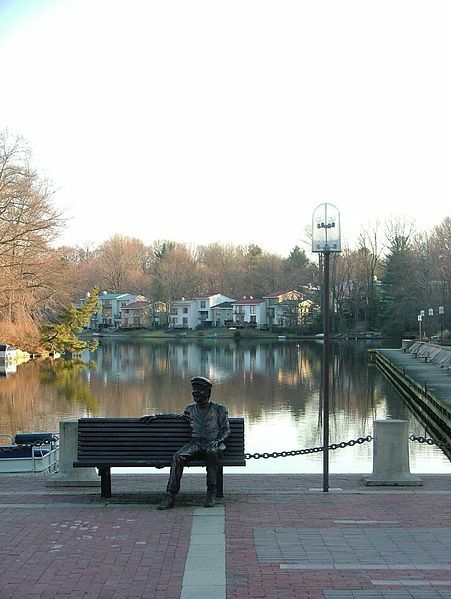 Phase 1 runs from Falls Church, VA to Wiehle Avenue in Reston. Phase 2 will run from Reston, through the Dulles airport, and it will end in eastern Loudoun County. 1. Where does Phase 1 start and end? 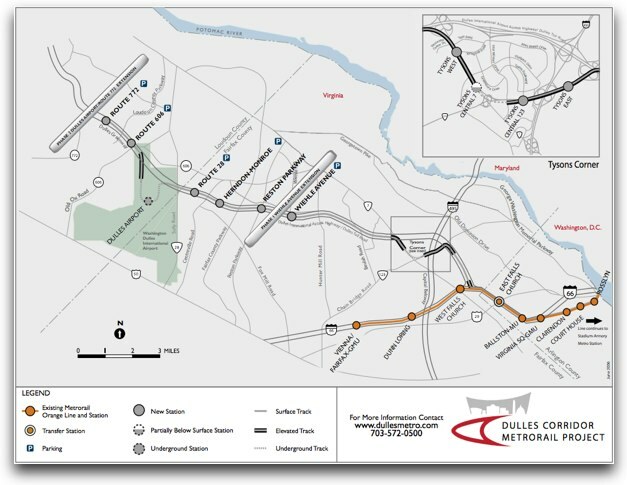 Phase 1 of the Silver Line starts at Wiehle Ave. in Reston, goes through Tysons Corner along Route 7, and runs along the Orange line at the East Falls Church station. The Silver Line keeps running along the Orange (and Blue) lines through DC, until the split of the Orange and Blue lines, where it joins the Blue line to reach Largo, MD (near FedEx field). 2. When will Phase 1 open to the public? Phase 1 of the Silver line finally opens on July 26th, 2014! 3. Where are the stations on Phase 1? 4. Where will Phase 2 start and end? Phase 2 will start at the Whiele-Reston East station, go through Reston Town Center following the Dulles Toll-Road, through the town of Herndon, through the Dulles Airport, and it will end a few miles west of the airport in Ashburn, VA.
5. When will Phase 2 open to the public? Phase 2 is still in the planning stages, with an estimated timeframe for opening in 2018. Its cost estimate is $2.7 Billion. Due to this cost and the current funding allocation, construction of Phase 2 could be delayed until consensus is reached as to how the cost issues will be addressed. 6. Which are the stations of Phase 2? There are 5 stations planned for Phase 2 of the Silver Line. Their working names are: Reston Parkway, Herndon-Monroe, Route 28, Route 606, and Route 772. 7. Will there be commuters’ parking for the Silver Line? There will be commuter parking lots at the following stations: Wiehle-Reston East., Herndon-Monroe, Route 28, Route 606, and Route 772. Please note that there won’t be commuters’ parking at ANY of the stations in Tysons Corner, Reston, or at the Dulles Airport. 8. Who is providing funding for the entire project? Funding is being provided by the Dulles Toll Road, the United States Federal Government, the Commonwealth of Virginia, the MWAA (airports authority), and Fairfax and Loudoun Counties. 9. Who is overseeing construction, and who will operate the Silver Line? The construction of the Silver Line is the responsibility of the Metropolitan Washington Airports Authority (MWAA). 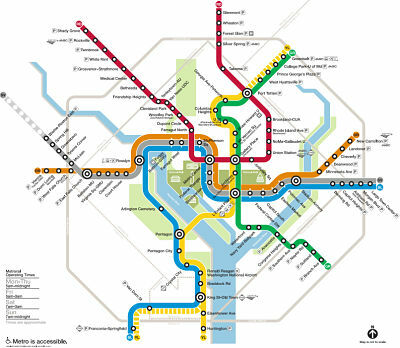 When each phase of construction is completed, the every-day running of the Line will be the responsibility of the Washington Metropolitan Area Transportation Authority (WMATA) – the authority that currently operates the other lines of the Metro. 10. Which school boundaries surround Phase 1 of the Silver Line? 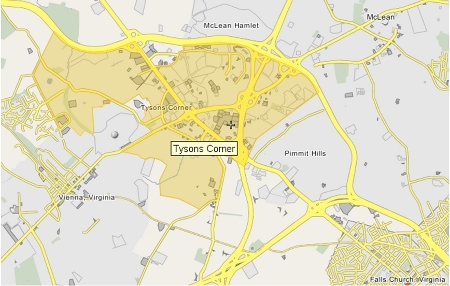 Near Tysons Corner, the high school boundaries are Marshall High School and McLean High School. Further west in Fairfax County, the school boundaries are South Lakes High School, Herndon High School and Westfields High School. 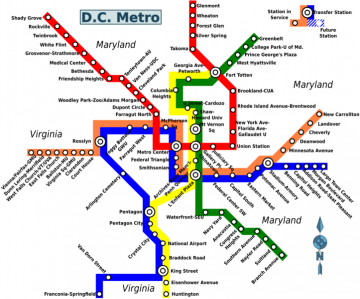 The new Silver Line of the Metro will provide much needed connectivity in the Northwestern part of the Washington, D.C. Metro area (i.e. Fairfax County, and Loudoun County). Its purpose is to connect important economic centers, to reduce traffic, and to improve the residents’ quality of life. 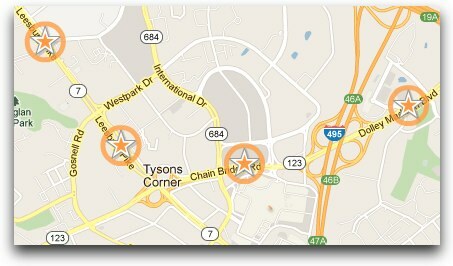 Do you want to find a home near the new Silver Line? 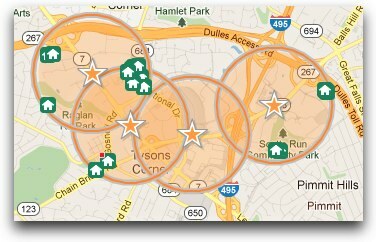 Homes within 1/2 mile of the Silver Line.